On the very day that Schulich School of Music professors Tom Beghin and Martha de Francisco started at McGill six years ago, they got to talking about a Haydn project. Beghin, a Belgian-born concert pianist and musicologist, had long planned to record Joseph Haydn’s complete keyboard sonatas. He knew of De Francisco’s reputation as the record producer for many prominent artists and a Tonmeister who had helped pioneer digital recording and editing in Europe. Naturally, they began to consider the recording possibilities. From the start, Beghin planned to use replicas of the 18th century keyboards for which Haydn wrote. But the project took on a whole new dimension when McGill colleague Wieslaw Woszczyk, a recording engineer and founding director of the Centre for Interdisciplinary Research in Music Media and Technology (CIRMMT), floated a novel idea: Why not re-create – through the magic of digital programming — the acoustical environments for which the instruments were originally designed? It did, and the result is The Virtual Haydn, a groundbreaking set of four Blu-ray discs just released by the Naxos label . The package includes 15 hours of music, performed on seven historical keyboards in nine “virtual rooms,” along with a documentary video on the making of the recordings. 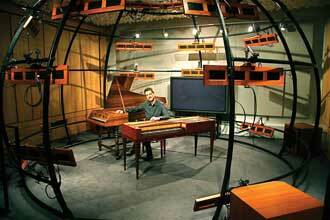 The spirit of technological discovery extended to the musical instruments. Haydn composed more than 50 solo keyboard works during a period of rapid evolution in the instruments. (This year marks the 200th anniversary of his death). The Schulich team collaborated with four distinguished keyboard makers, who produced a unique collection of replica instruments, including a 1755 Viennese harpsichord, a 1760 clavichord, a 1788 “square piano,” a 1790 fortepiano, and a 1798 English grand piano. Certain of the instruments hadn’t been heard or played since the 18th century. To recreate the acoustics of 18th century rooms in which the sonatas were performed, the Schulich team retraced Haydn’s path across Europe, electronically “mapping” the impulse responses in selected spaces — from the intimate 6-metre by 4-metre study in Haydn’s house in Eisenstadt, Austria, to the high-ceilinged Eszterhaza Music Room in Hungary, to the 21-metre by 10-metre Holywell Music Room in Oxford, England. To eliminate noise from street traffic, the team sometimes took the sonic measurements in the middle of the night. Back in Montreal, the characteristics of each room were replicated in the Immersive Presence Lab lab at CIRMMT’s quarters in Schulich’s New Music Building on Sherbrooke St. Surrounded by a dome of loudspeakers, Beghin would play an historical keyboard while a digital processing system recreated the acoustics of the original room. The marathon recording sessions spanned several months.